DeliveryRL is a 7DRL entry! DeliveryRL is an attempt to flip some common roguelike patterns around. Instead of wading your way through a pile of monsters and gore to steal an artifact and escape, instead you're trying to slip by the denizens of an ancient dragon's lair and deliver a pizza before it gets cold. DeliveryRL tries to offer some alternatives to combat, hopefully making you feel a bit more like a runner and less like a warrior. Welcome to DeliveryRL! You are a typical delivery person for a most unusual pizza shop. Sometimes your store gets orders from mythical creatures. Today an Ancient Dragon has ordered a pizza and expects it to be delivered promptly, and warm! Why does a dragon need delivery? It's not your job to ask those questions, but you drew the short straw this time. Race to the depths of the caverns and deliver the pizza to the Dragon who is waiting. Survive by avoiding monsters, fighting for your life, and distracting them with some extra food you brought along. You also have a special trick up your sleeve, the ability to warp a short distance. It tires you out but don't let that slow you down; time is of the essence, after all! Maybe you can scrounge up something useful from past adventurers, but remember: even though you can teleport you're no warrior! You will find the dragon on the 10th floor! Check out the README. Everyone should be able to run the windows exe build via wine (x64 wine prefix). The linux binary may or may not run as is. To run it you need SDL2 and SDL2_image. Feel free to let me know if you have any issues. 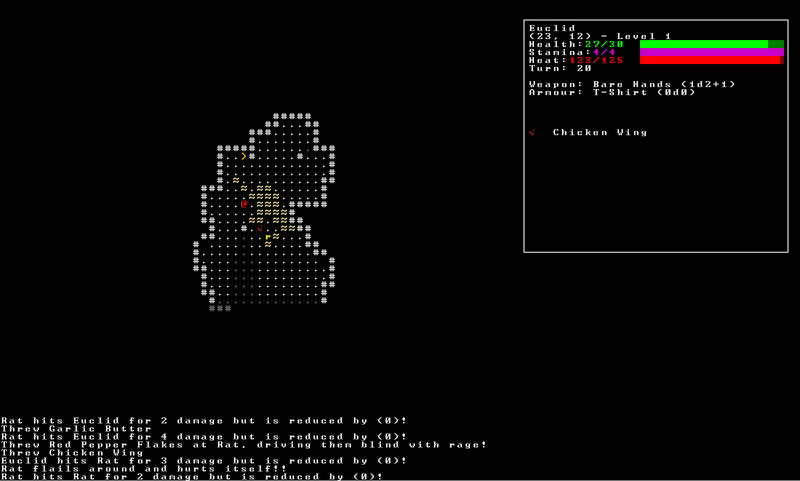 Also feel free to compile from source (build tag 1.0.5 for the 7DRL version). 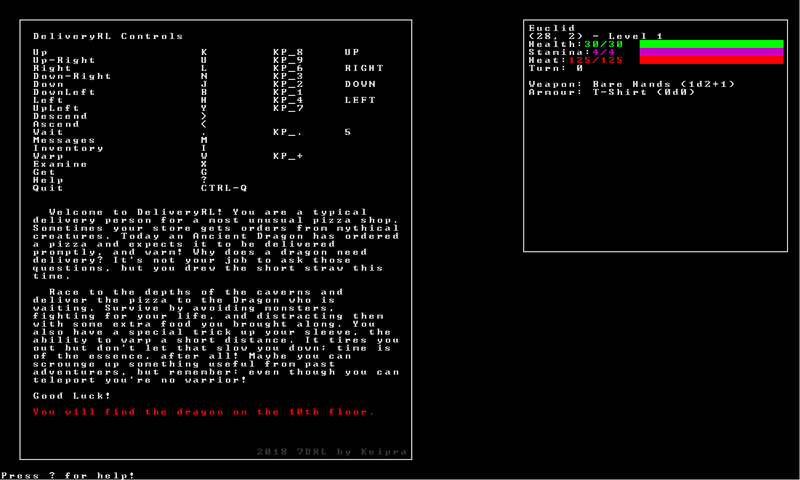 Version 2.0.2 and onward have an ingame size control and resizeable window. If you're a version before 2.0.2 and the game the game is too small for you display you can increase the size by specifying a new font information on the command line. You can find all of the choices by listing the contents of the assets/font directory. The default is cp437_12x12.png. 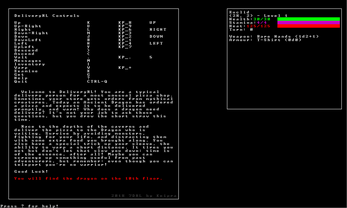 Thanks so much to irskep for helping me provide an OSX build during the 7DRL competitionn. You will still need to install sdl2 and sdl2_image but then you should be able to run DeliveryRL from the OSX archive in the downloads below. If you can't get that to work please consider downloading the windows+linux archive and trying the wine version before giving up! I now have an OSX build running on free travis-ci osx infrastructure! This game was built from a prototype example game I developed a few months back so I am starting from an existing "engine" I have that has a bunch of prototype systems. It needed an immense amount of polish and all of the things added (and removed) that makes it this game and not just a game where you wander pointlessly through a procedurally generated dungeon. Fix regression in loading assets relative to executable. FOV is now circular rather than square. Removed boxes around message log and HUD. Added monsters, their hp, and debuffs to the HUD at all times. Move throw/warp cast dialogs to center screen. Font selection behaves better when overriding fonts. Add the ability to cycle through font sizes on the intro screen. Window is resizeable at all times. Can rest to full while monsters not in sight by pressing r or 5. Decreased default font size from 16 pixels to 12 pixels. Fixed incorrect config flag descriptions. Added Start/Quit choices on main screen. Fix positioining of text in full message log. Change RNG. 1.X seeds are not compatible with 2.X. * Assets are loaded relative to the executable instead of your working directory. Can now restart from the title screen after losing or winning. Victory dialog shows turns and heat. Fix bug in rendering library, reducing CPU usage by 50%. Examine cursor now works with numpad and arrows. Examine interface shows if a monster is slowed or confused. HUD shows if the player is slowed. Throwing target selection inspect selection now more like the warp interface. Stairs are now colored orange instead of white. Inventory cursor can wrap around. Fixed coloration of Inspect UI. Grease slows monsters while in it instead of if they were in it last turn. Add information about where to find the dragon. Accidentally built 1.0.1 with an unsaved file missing a few minor balance tweaks. Hand warmers are now slightly less effective to offset the gain in power from adding their flat +10 bonus. 7DRL - Day 6, Level Design Really Matters! 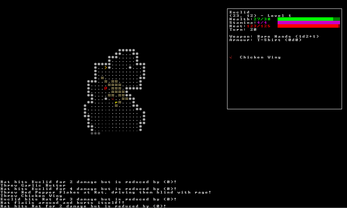 Definitely one of the best games on this 7drl. I would change heroism potion from 2d4 to 1d2 though. At first I was thinking that it only restores stamina and that's all. But with such huge boost even a couple of heroism potion makes your character too powerful.